Pollution: Noun – from Latin ‘pollutio’ – the introduction of a contaminant or contaminants into the natural environment, thus causing unwanted and adverse change. Protect the River Suir you love. The continued pollution of the river Suir, here in the centre of Thurles, goes on unabated. The limestone banks constructed some 20 years ago, by environmentalist; the now deceased Wilbert Huben and his then Tidy Towns Team, were then strongly resisted by North Tipperary County Councillors, some of whom used every possible means to halt this development, including seeking help from the Irish Fisheries Board, who in turn issued threats of court action. Today, the careless dumping of contaminants e.g. 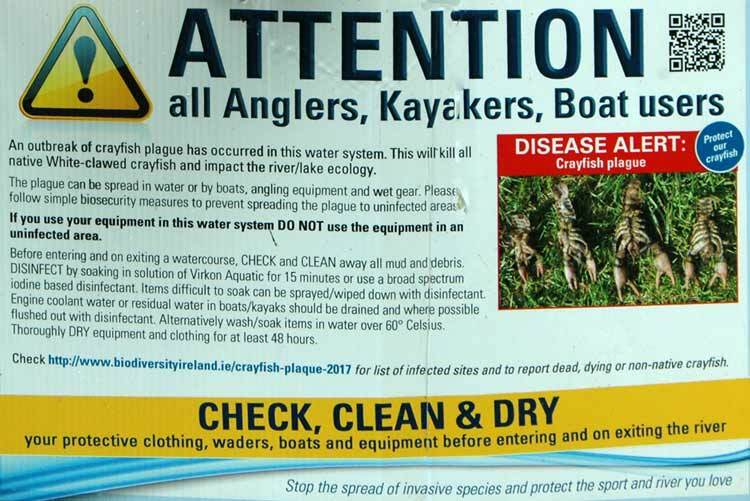 plastic items, beer cans, a series of unidentified chemical spillages (see video clip above), the uncontrolled growth of weeds and willow tree saplings etc., now trap these pollutants, resulting in the choking to death of this rich, living water resource. We learn that Local councillors, [members of the Templemore / Thurles Municipal District] at this month’s meeting of Tipperary County Council are ‘calling’ again; this time seeking fishing facilities to be installed in Thurles on the river Suir. They would like to see board-walks and other facilities put in place, to assist those already fishing, and to attract more people into the area. Director of Services with the local authority, Mr Pat Slattery put a stop to these ‘callings’ by stating, “We’re looking at tying in this idea with another project“. Once again enigmatic Tipperary County Council officials are saving up a big surprise for both elected councillors and urban dwellers. For those who wish to refute this stated assessment, please view the signs posted at the “Swinging Gates” opposite Thurles Leisure Centre and at Lady’s Well, latter further down on the river bank. This is, after all, ‘Local Election Year’ for new potential local councillors and for those elected councillors, who, over the last five years have accomplished absolutely nothing. District residents are now expected to rush out to polling booths; to vote on May 24th next, granting substantial extra income to double jobbing individuals, many of whom will quickly vanish silently back into the woodwork, to remain ‘Dumb and Dumber’, until a couple of weeks before the next local election, due in 2024. It is now quite obvious that these elected councillors are spending too much of their time on Facebook in their efforts in ‘pre-election vote gathering’. We now invite them to take a breather and walk just 20 metres (a mere 65ft) along the water front area, between the Thurles Leisure Centre and the River Suir. Warning: Watch you don’t slip. No, I am not referring to the surrounding crude graffiti currently on show: instead keep your eyes strictly focused on the water’s edge. Now, ask yourself why here in the heart of our rural town, you have, on your watch, allowed a rich living water resource to be turned into an almost lifeless smelly cesspool? Through your lack of proper governance, no self-respecting fish will ever be caught in this area and indeed if an angler were lucky enough to catch some misguided, disorientated, gill-bearing aquatic animal here; sad to say, it beggar’s belief that he / she would ever eat it. New 40 Bed Unit For South Tipp. Gen. Hospital On Schedule. 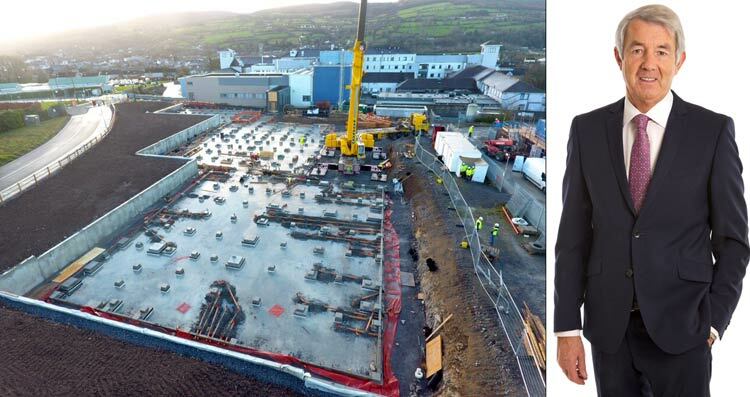 Independent TD Deputy Michael Lowry in a statement today confirmed that there is no justification or need for hyped up exaggerated concerns regarding the opening of the new 40 Bed Modular Unit for South Tipperary General Hospital [S.T.G.H]. Ground works at S.T.G.H., showing the positioning of the new, welcome 40 Bed Modular Unit; as it looked back in early February of this year. Mr Lowry stated, “I am pleased to confirm that work on the new 40 Bed Modular Unit at S.T.G.H. is running to schedule. We understand this two storey building which will have 40 ensuite single rooms will be ready for handover to the HSE in August. In the meantime, the capital funds, already allocated, will be used to source and purchase the equipment and medical devices to service this new unit. Deputy Lowry continued, “Last Friday I walked through the new building. It is really very impressive. I am delighted with progress. It is a new concept, the first of its kind in Ireland. On my visit to the site on Friday, I met with the Chief Executive of the H.S.E. South/South East and with the Hospital Manager. Both are totally committed and eagerly anticipating the opening of this exceptional new facility. The H.S.E. has also confirmed to me and the Hospital Manager that the necessary funds to staff and open the Unit, are available. The Director of Human Resources, with the approval of the H.S.E. has already commenced a campaign at home and abroad for additional personnel. Interviews for some employment positions have already been held and panels now established. The New Unit will be open and available to patients towards the end of this year. This fantastic, state of the art facility is well on the way to delivery. I am determined to see it through to conclusion”, Deputy Lowry concluded. “The silence is deafening; the inaction demonstrates sheer abandonment by Councillors and Politicians”. Limerick University Hospital, Dooradoyle, serving North Tipperary Area. Patients sent to hospitals servicing Co. Tipperary can expect to be in for a long waiting time today. The Emergency Departments at South Tipperary General Hospital, Clonmel and University Hospital Dooradoyle, Co. Limerick, latter which services North Tipperary, has 40 people and 68 people (Total 108 persons), respectively waiting for a bed. The INMO confirm today that both building are once again the most overcrowded hospitals in Ireland. 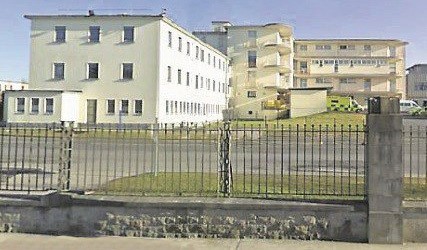 The hospital with the worst level of overcrowding in March of this year (2019), was again University Hospital Limerick, with 1,054 people left without a bed. In view of all this; whatever about sitting TD’s, I personally can’t see dreams coming through for Fine Gael’s Mrs Mary Newman Jullian (Mary For Tipperary) and Mr Garret Ahearn (A New ERA in Tipperary), at the next General Election, despite attending in the crowd at the recent ‘An Post’ protest March in Liberty Square, Thurles, last Friday. Maybe it is time for another protest march in Liberty Square, this time to demand action on hospital beds for North Tipperary patients. For “Death By Geography For Tipperary Dwellers”, (Dated Oct. 2016) do please click HERE. UPDATE April 3rd 2019: New record claimed by University Hospital Limerick, servicing North Tipperary: Eighty one (81) patients without a bed in their facility today; the highest daily figure ever recorded for ‘waiting for a bed’ in an Irish hospital. Someone call Guinness Book Of Records. Meanwhile, today April 3rd 2019, serving South Co. Tipperary; South Tipp General hospital has forty patients being cared for on their corridors; in their Emergency Department or in overflow areas, again without a bed. A total altogether of 121 patients for within the county. “Our next clinic will be on Wednesday April 10th 2019, from 10:00am to 1:00pm, in St Mary’s Health Centre, Castlemeadows, Thurles, Co. Tipperary. 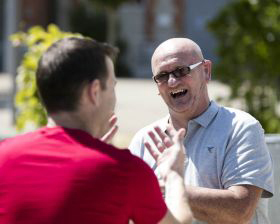 This is a free and confidential support service, dealing with all aspects of deafness and hearing loss. The clinic offers information and resources, assistive technologies, minor repairs, hearing aid batteries, [latter €2 a card] and much more. Further upcoming clinic dates for Thurles identified are:- May 8th and June 12th 2019. Do remember that elderly neighbours and elderly parents may not be comfortable with using social media, so having read this announcement, please do let them know verbally. Should you require further information, please contact the resource office at ‘Chime’, Pery Street, Limerick, Tel: 061 467 494; Fax: 061 467 497; Text: 087 6839754; or Email: alona.troy@chime.ie – or why not check out our Website at www.chime.ie “.